ViXL-3D. The ViXL project is our newest and most exciting project to date, our first consumer-focused application to be released under the Cassinian brand. The name "ViXL-3D" is an acronym for "3D Visualizer for Excel" which is how the ViXL project began.. as a way for us to visualize printer color gamuts and calibration data in Microsoft Excel®. Although originally developed as an in-house tool, we quickly realized that ViXL could be used to visualize many types of complex data common to financial, engineering, scientific and research disciplines. So we turned our in-house toolkit into a full-featured Excel add-in that anyone could use. To read more about the ViXL project's background, its current status and future release goals, click here (and check out the new product videos). 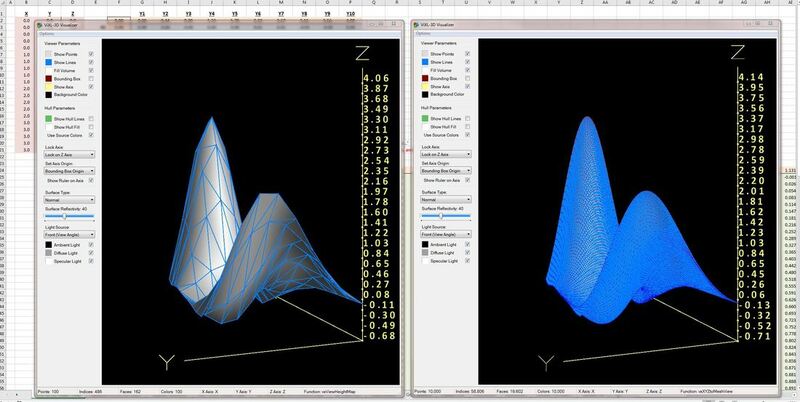 The image on the left is an example of the XYZtoUnformMesh() and ViewHeightMap() functions. The video shows the relationship of UST yields for a 100 week period for 5-, 7-, 10-, 20- and 30-year bonds. ViXL-3D is launching as a Kickstarter campaign, check it out Monday, July 2, 2018! Printer Calibration. This is where Cassinian started in June 2016, developing tools to automate inkjet printer calibration, color management and process control for commercial printing and sign making. These software tools are licensed primarily to OEMs, such as commercial printer manufacturers, system integrators and software developers. For us, we see printing as a manufacturing process; and, like virtually all manufacturing processes, calibration and process control are critical to achieving quality, consistency and profitability. Contact us today for contract engineering and OEM licensing services.